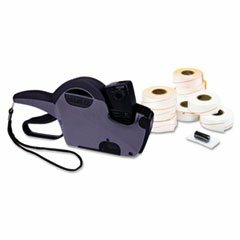 ** Durable pricemarking labelers feature easy drop-in loading and a self-correcting feed mechanism for jam free operation. Handle has rubberized grip for comfort. Easy to adjust print bands produce crisp, fast drying characters. Also features ink roller storage slot and attached user guide. Includes ink roller and lanyard. Model: 22-8; Label Width: 13/16"; Label Height: 7/16"; Number of Lines: 1.